Eventually, auto enthusiasts of the Australian persuasion will rise up with pitchforks and torches and rebel against their fun-hating government. 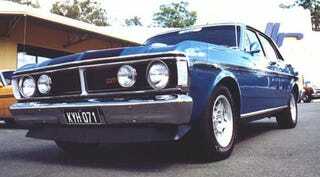 On Sunday, police in New South Wales descended upon a gathering of motorheads and proceeded to search 72 vehicles, issue 39 tickets and impound 18 vehicle — one of which was a rare $200,000 Ford Falcon GT. This wouldn't be such a huge deal except for that part about the impounding being permanent, and the vehicles being sent to auction, and the proceeds going to government coffers. Adding insult to injury for that Falcon driver, what was the offense? A second burnout ticket.